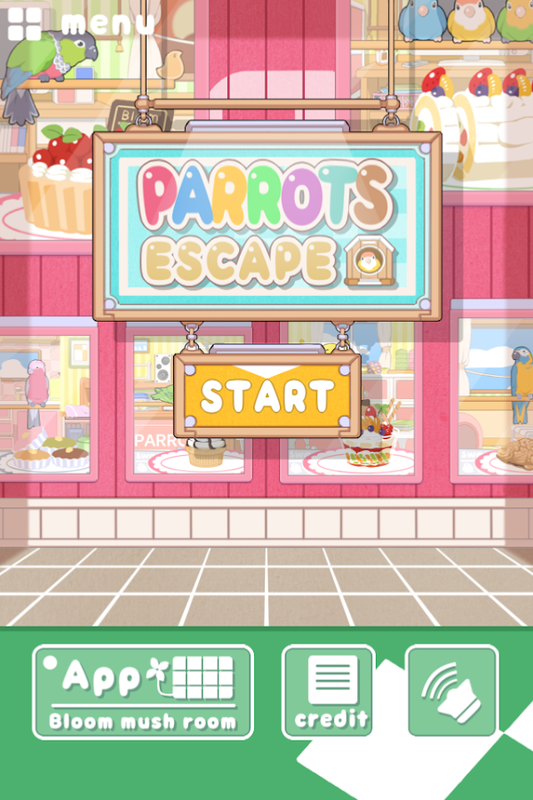 In this game, you must escape from a room with parrots in it.Thedifficulty is low.At each stage there is also a card depicting aparrot hidden in the room.We hope you enjoy playing this ratherunique escape game! Slide-the-parakeets puzzle.Slide the other parakeets to let themain parakeet out.With each level completed, you will discover newfriends that will appear on puzzle screens and parakeets'rooms.Cute parakeet voices, many parakeets, 60 types of parakeets,and more to come.This corresponds to ranking, so you can play withfriends too.Do try this game. 〇ストーリーその古城には一人と一羽しかいなかった。ここはどこで、なぜ誰もいないのか。いつからそうなのか。〇ゲームシステム見下ろし視点型の脱出ゲームです。ステージクリアで、ストーリーが展開されていきます。姫と執事の会話を楽しみながらプレイできます。また、ステージごとに隠されたシークレットファイルを集めていく要素もあります。謎がわからない時にはヒント機能もありますので安心です。いつもと少し変わった脱出ゲームとして遊んでいただければうれしいです。※android5.0でのみ、音楽が流れない症状があります。そのままでも遊べますが、可能であれば android 5.0.1以上にアップデートしていただけるとより楽めます。音楽がヒントになっている謎はありませんので、ご安心ください。Yes StoryItwas only one person and one bird in the old castle.Where is here,why not anyone. What time from the right.Yes game systemIt islooking down perspective type of escape game.In clear the stage,the story will continue to be expanded.You can play while enjoyingthe conversation of the princess and the butler.In addition, thereare also elements that will collect secret files hidden in eachstage.When the mystery is not known it is safe because there isalso a hint feature.I am glad if you can To play as a littleunusual escape game always.※ In android 5.0 only, there aresymptoms that music does not flow.You can play as such but, Masu Memore comfortable if you are able to update if possible android5.0.1 or higher.Since there is no mystery that music is in thetips, please do not worry. Can be quickly confirmed when needed, it is piano chords tableapp.By touching the keyboard part, you can also check the actualsound.Please use means for playing and composers. 猫の手を操作して、花火が消えてしまわないように風から守ってください。 プレイ回数やスコアに応じて猫の日記を読んでいくことができます。難易度も優しく、短い時間で遊べるゲームになっていると思います。ネコが飼い主に再び会うことができる時は来るのでしょうか？季節外れの花火ですが、すぐにクリアできると思いますので、ぜひ一度遊んでください！Byoperating the hand of the cat, please protect from the wind asfireworks is not Shimawa disappear.You can go read the cat diary,depending on the number of plays and score.Difficulty also gently,we think that has become a game to play in a short time.Or Willcome when you can meet again in the cat owner?Although it isfireworks out of season, so I think that it soon be cleared, pleaseplay certainly once! It is a escape game where cute cats and parakeets emerge. Theroomis full of mysteries Sometimes we asked parrots to cooperate,Evenbeing interfered by a cat! What? Hint function is alsoavailable sofeel free to play. Lost in a back alley, you find a passageway to four worlds! Go onan adventure through the worlds that open up behind the four doors.What happens after you've traveled through them all? When youencounter a puzzle, don't worry. There will be clues along the way! Somehow, You are trapped in a room like a basement surrounded bystone wall with no exit. Let's escape from here by using what is inthis room. - What’s Escape Game ? - The purpose of this game is toescape from here. Use the items, solve the gimmicks & riddles,and escape from here. - When you want to stop playing - The statusof the game is automatically saved. If you want to start again,please touch the LOAD GAME button from the title window. - When youstuck - If you press the HINT button at the top menu bar, some hintcards are dealed according to the progress of the game. Use it whenyou stuck. Do you like puzzles and hidden objects? Playing games from 100Doors series? Then this point and click game is exactly what youneed! Use all your skills to complete all levels and get allachievements. Features: - exciting puzzles; - point and clickgenre; - cool mechanics: the movement in time and space, combiningobjects, search for hidden objects, puzzles and more; - amazinglevels with really nice animations; - the game is absolutely FREE;- nine beautiful and detailed locations; The main goal in 100 DoorsPuzzle Box is to escape the room. Using all the possibilities ofthe device you need to open each of 100 doors and move the elevatorto the next floor. Search for hidden objects, sovle puzzles and usean items to do this! Play new point and click 100 doors game forFREE NOW! There are problems with passing some of 100 doors or havea suggestions? Contact us in social networks: VKontakte:https://vk.com/proteygames Facebook:https://www.facebook.com/proteygames We are making games with thesoul! Escape from a Japanese Inn! "An Ocean View Ryokan" is the 13thEscape Game produced by FUNKYLAND.This game is fairly simple, youneed only escape from one room.Find the items and solve themysteries to escape from an Ocean View Ryokan♪.How to Play:- Justtap- Tap the item icon twice to enlarge the display.- Tap the [+]button in the upper right hand corner to display the settingsscreen.Game Features:- Beautiful graphics- Auto-save- Easy and fun,even for those not keen on escape games- Perfect game length tokill timeThe Save Function:The game auto-saves items you'veacquired and instruments you've unlocked, allowing you to restartat the last auto-save checkpoint.In case you can't restart, pleasecheck your device settings as there may not be enough storagespace. Let's find 5 Alice characters! The popular FUNKYLAND game ofescaping rooms themed like "Alice's Adventures in Wonderland" byfinding characters is now available as an App! Solve the mysteriesin the room to escape. It is a bit more difficult than "CandyRooms" and "Fruit Kitchens", the sister games. Try the wondrousworld of Alice. How to Play: - Just tap - Tap the [+] button in theupper right hand corner to display the settings screen. GameFeatures: - Beautiful graphics! - The room to enjoy a fantasy ofAlice! - A little bit difficult game! - Perfect game length toenjoy an escape game lightly! The Save Function: Cleared rooms willbe saved in the list so you can play them anytime. In the case thatcleared rooms have not been saved in the list, please check yourdevice settings as there may not be enough storage space. The listof rooms: No.01 The White Rabbit Hole No.02 The Pool of Tears No.03House of White Rabbit No.04 Mushroom and Blue Caterpillar No.05House of the Duchess No.06 A Mad Tea-Party No.07 The Queen'sCroquet Ground No.08 Mock Turtle and Gryphon No.09 Alice's EvidenceNo.10 Where is Alice? Can You Escape 5 - room escape games just reached the new level!Letus present you the fifth episode of the legendary Can You Escapeseries!Can You Escape 5 brings the classical room escape back toyou! This time we have prepared 18 different rooms for you - allstuffed with high-end puzzles, amazing graphics, mind mind-blowingriddles and much more! If you think you still have what it takes toescape all those rooms then go on and download the best Can YouEscape episode ever made!↗ Gorgeous graphics!↗ Smooth storyline.↗Highly addicting!↗ Innovative puzzles.↗ World Class room escapegame!